A THIRD set of revised timetables are being introduced by Govia Thameslink Railway. The operator has struggled to maintain its services since major timetable revisions on 20 May. The new timetables are coming into operation for their first weekday trial today. 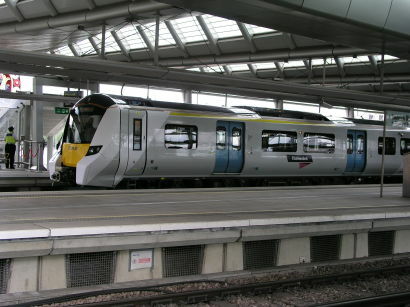 GTR marked the changeover by booking an advertisement in the Metro, which is the free newspaper distributed in the London commuter area, in which it apologised for the timetable problems. An earlier replacement GTR timetable introduced on 4 June had limited success, with some cancellations and delays still continuing. Meanwhile, the government has revealed that it has launched a review of the GTR franchise, which will be in addition to three separate inquiries into the timetable problems which have already been announced – one of them by the Office of Rail and Road. Meanwhile, there was some encouraging news for Northern passengers when the RMT called off a strike which had been announced for 21 July. Northern is also operating temporary timetables at the moment, after problems following its changeover on 20 May. However, further strikes are set to be staged on South Western Railway in the continuing train staffing dispute there. Strikes are planned for 26, 28 and 31 July, 4, 11, 18, 31 August and on 1 September. Disruption also affected Northern and Great Western Railway yesterday, because fewer train crews than usual had volunteered for Sunday shifts, according to the companies affected. There were several possible reasons, which included the final of the World Cup and also the start of school holidays in some areas. Trains were cancelled on a number of routes, with GWR losing services to the Cotswolds and the far south west as well as south Wales. Trains to Cheltenham, Penzance and Newquay were among those affected.